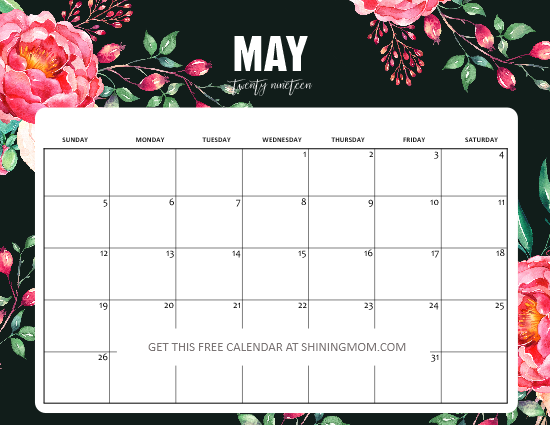 Free Printable May 2019 Calendar: 15 Awesome Designs! 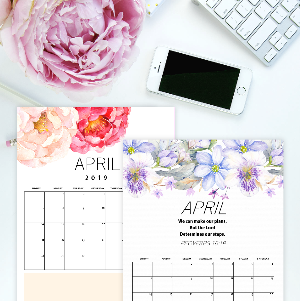 Free Printable May 2019 Calendar Planners: 15 Awesome Designs! 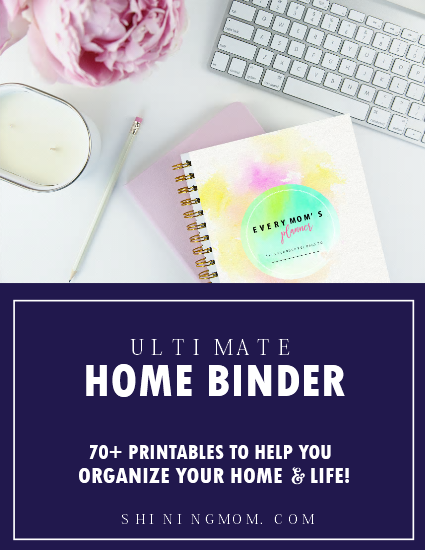 Get ready to organize your schedule. 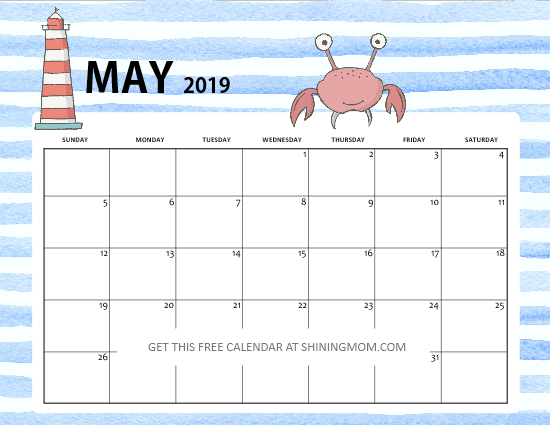 Here’s a collection of free printable May 2019 calendar planners that you can use right away. Set your priorities and map out your plans for the entire month. 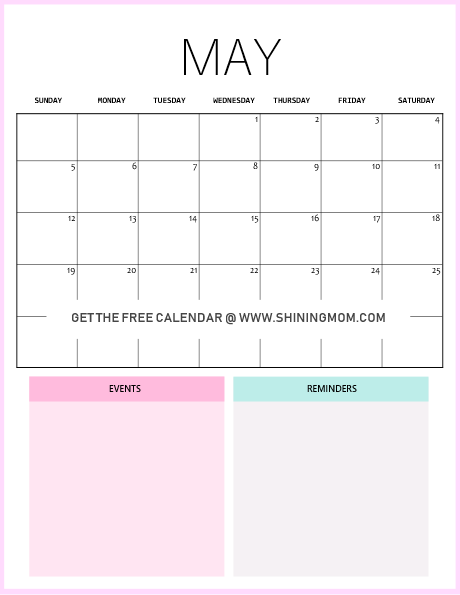 These calendars can help you make your May amazingly productive. Scroll down to view the 15 beautiful designs! Which calendars are you going to print for yourself and your loved ones? It’s time to take your pick! 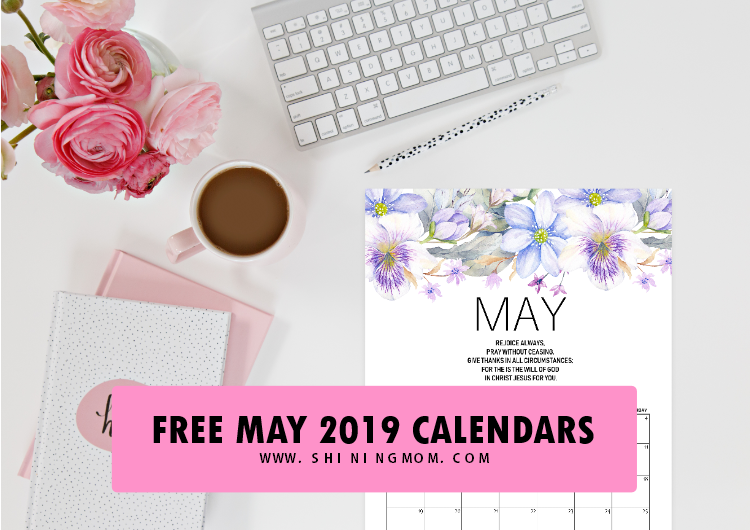 Ahhh, I am especially excited to release your free printable May 2019 calendar because I made sure they all come beautiful and special. But why, it’s my birth month! I wanted to treat all of you with lovely calendars to enjoy. I have carefully handpicked my favorite designs from the previous releases and added new styles to share today. I designed each calendar (incorporating graphic elements from amazing artists from Design Cuts and Creative Market) with love and joy. I hope you’ll feel the warmth in each and every calendar that I am sharing today. 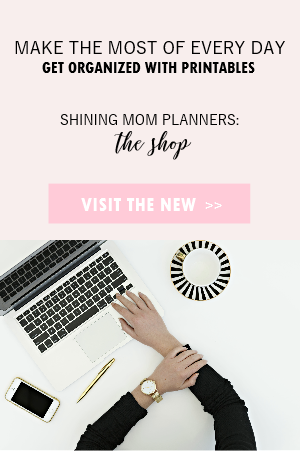 It’s my little way of thanking you for following along this humble blog, the Shining Mom blog! Ready to view the designs? Let’s get started! 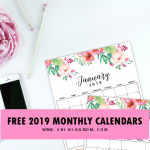 The first batch of calendars that I am sharing away comes in enchanting and refreshing florals that are all oh-so-gorgeous! I really do love these calendars, I hope you do, too. 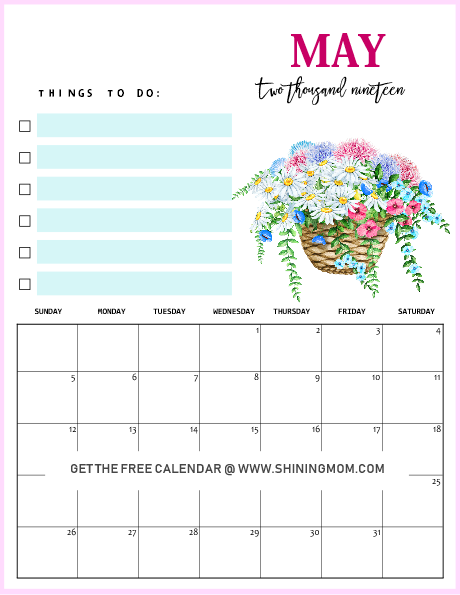 Looking for a pretty calendar to use? This first one exudes beauty, calmness and grace. It can inspire you to be passionate in your craft and in your daily doings. Print out this calendar for your home and office. 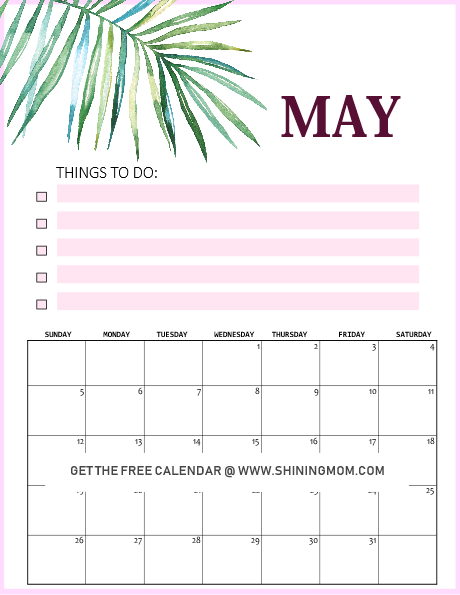 It is going to be a great calendar to use to organize your tasks and schedules for the whole month of May! I just love what Hellen Keller says about the value of staying positive. She says, “Keep your face to the sunshine and you cannot see a shadow.” How about waking up to this quote as you check your calendar in the morning? Won’t it inspire you to always look on the bright side of life? Let’s stay optimistic, friends! 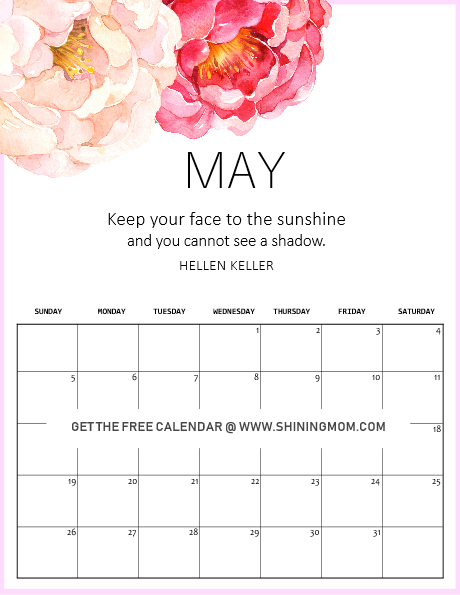 Guess what has been the most requested Shining Mom calendar of all time? It’s this one! 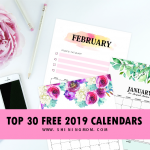 Just like several followers of this blog, you can enjoy this calendar as a kitchen calendar or home calendar. It’s the perfect calendar to stick onto your fridge’s door for your monthly evening menu. You can also have this as your family’s chore or activity chart! I just so love this passage that speaks three short commands: “Rejoice always pray without ceasing, give thanks in all circumstances …” Short commands that full capture how God wants us to walk our days. He wants us to always choose to be happy. He wants us to pray. And He wants us to be thankful! 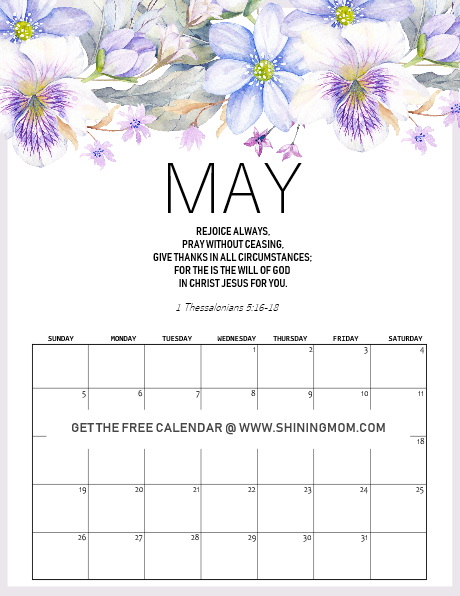 Print out and use this May 2019 calendar with Bible verse to be reminded of the 3 short orders to have an amazing life all day, each day! The next set of calendars are designed for the little ones. 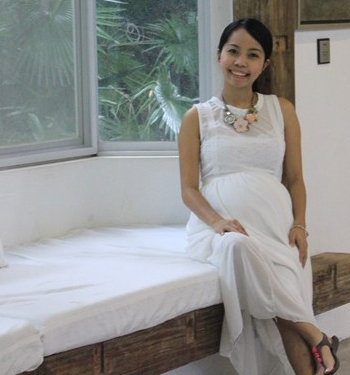 They come in playful, colorful and cute styles. Pick a calendar to give to the kids in your life (but you can definitely use them yourself, too)! Summertime is here! Stir in the happy summer vibe to your kid’s calendar by printing out this cute one for them. 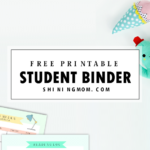 This calendar is a great organizer to include in their binder at school. Check out how cute and fun it looks! 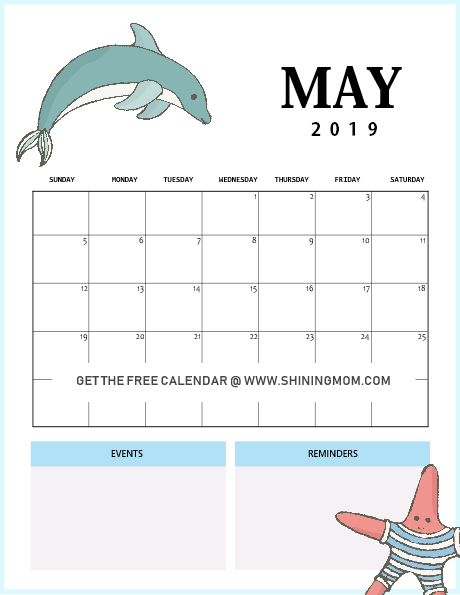 Next up is another free printable May 2019 calendar in summer theme. I guess kids will love to use this fun calendar with a cute jumping dolphin and a cute dancing starfish! Another great calendar to use at school. 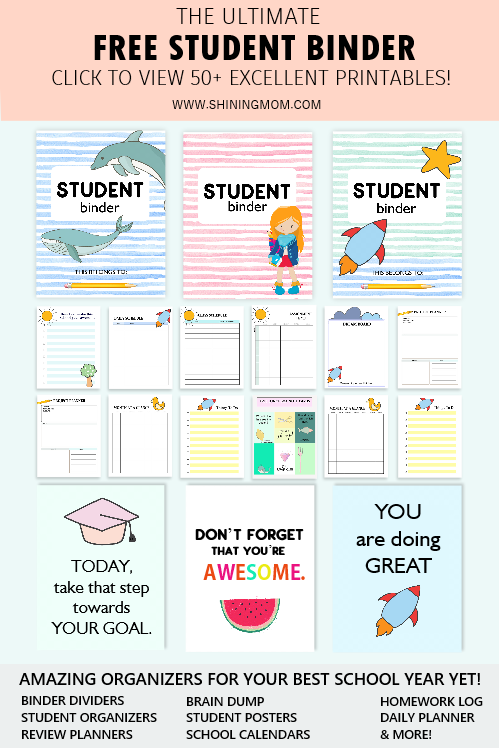 It includes a spot for the little ones to list down important events and reminders! Moving on, the last batch of calendars that I am sharing with you are the minimalist ones with allotted spaces for your notes and to-do’s. 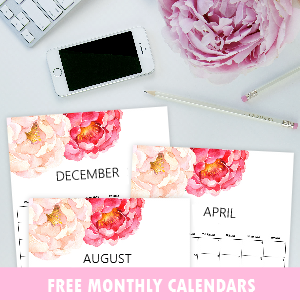 If you like to use clean calendars that are less on ink, these ones are for you. Keep scrolling to view the rest of the designs! What are your major goals to achieve for the month of May? Identify these goals and write them down right in your calendar. You will be reminded of them every single day. You are likely to stay more focused with your goals that way! Similar to the calendar above is this May calendar in charming spring florals this time. You can again write your to-do’s right in this calendar for a month-long of productivity! That’s it for our May calendars! Which ones are you favorite? You can view the rest of the designs in your download as I have included 15 calendars all in all! The vertical calendars are subscriber-exclusive calendars, simply CLICK HERE for your calendars to be sent straight to your inbox. The horizontal calendars can be downloaded instantly, simply CLICK HERE to receive the files. Print the calendars in US standard Letter size paper with in 8.5×11″ dimensions. Print as many as you need for as long as they are for personal use only! No time to print the calendars yet? That’s Okay. 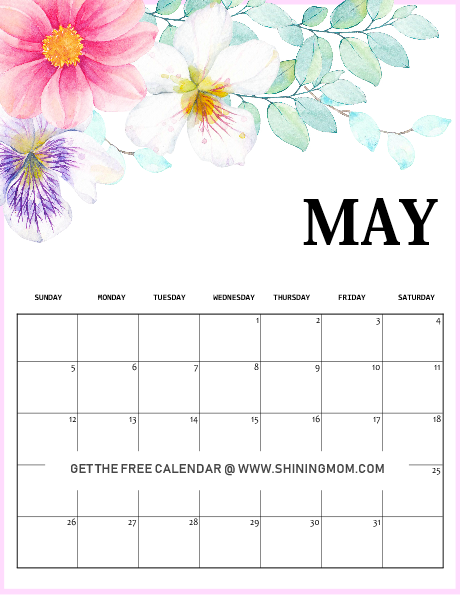 Save your favorite free printable May 2019 calendar for later by pinning the image below on Pinterest! 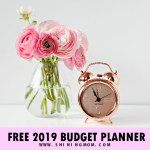 Free Life Planner: 50 Beautiful Organizers! 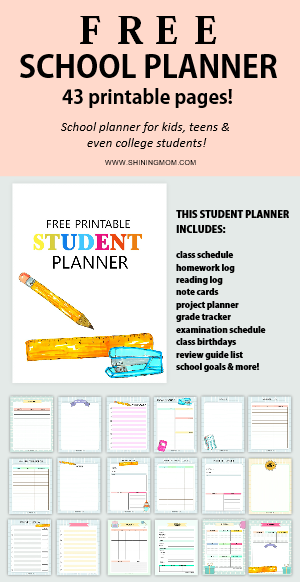 Ultimate Student Planner: 43 Pages! 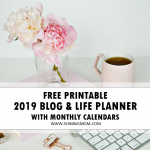 « Get Your March 2019 Calendar & Planner!